The Gypsy Vanner Horse Evaluation Program has been developed as an educational tool for the horse breeder, to promote thoughtful breeding of Gypsy Vanner Horses of the type as detailed in the breed standard, and for the public to educate them about the breed. The program’s purpose is to help breeders and owners to educate themselves about the strengths and weaknesses of their horses so they can use this knowledge in making educated breeding and purchasing decisions. This system should be viewed as an important tool to help preserve the wonderful characteristics of the Gypsy Vanner Horse. The conformation-movement evaluation is also an integral part of the GVHS Registration process. Horses lacking DNA verification of both sire and dam require a certain minimum conformation-movement evaluation score to move from the GVHS Pre-Studbook into the Regular Studbook. To educate about the breed. As an important part of the Gypsy Vanner Registration. Contact the GVHS to schedule an evaluation in your area. TEXAS – March 22, 2019 Location – Will Rogers Arena, 3401 W. Lancaster Ave, Fort Worth, TX. This evaluation is the Friday of the Annual General Membership meeting weekend. 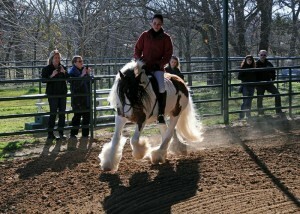 There is also a Gypsy Vanner show that weekend at the same location. ONTARIO – May 18, 2019 Location – Deerfield Stables, Palgrave, Ontario. MINNESOTA – October 25, 2019 Location – Rosies Gypsy Ranch & KD Performance Horses, 12564 CR 160, Saint Joseph, MN. Breeders & Judges Seminar following on October 26-27.